This photograph would be a perfect commercial for Crayola. I photographhed this portrait session for Project Nursery to document this little boy's room changing from his nursery to a big boy bedroom. It was so fun to work with the editor for Project Nursery, a blog that I personally had followed for a couple of years even though I no longer had babies. This was one of the early projects to introduce their new blog, Project Junior. I was grateful to work with Project Nursery to capture not only this little boy's room but also his big brother's bedroom, a family portrait session, a newborn portrait session and their new baby's new nursery. I love working with my clients for multiple sessions, and getting to know their families and sometimes creating wonderful friendships in the process. 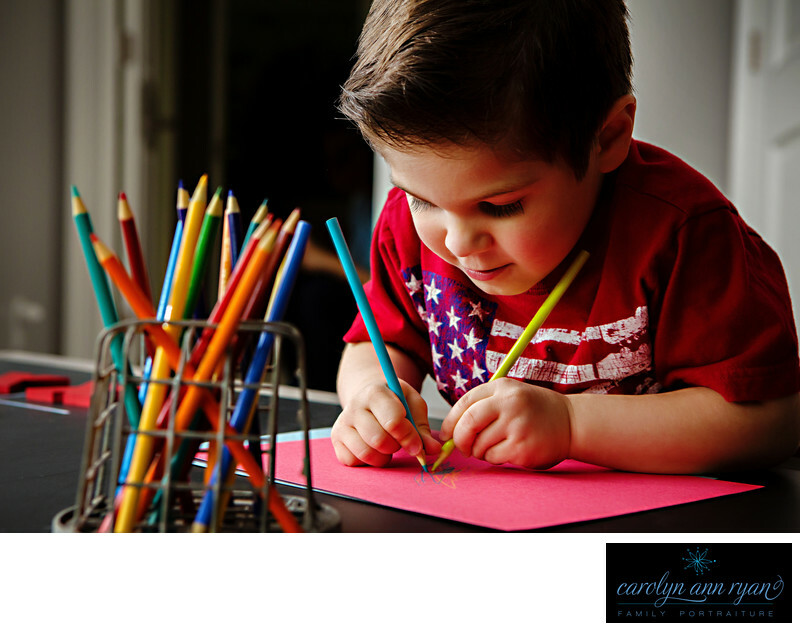 It is truly a privilege to be welcomed into my client's lives and be a part of their special family moments and their history.Keywords: American Flag (3), boys (120), crayola (3), indoors (30), Project Nursery (3), red (51). 1/80; f/5.0; ISO 640; 62.0 mm.